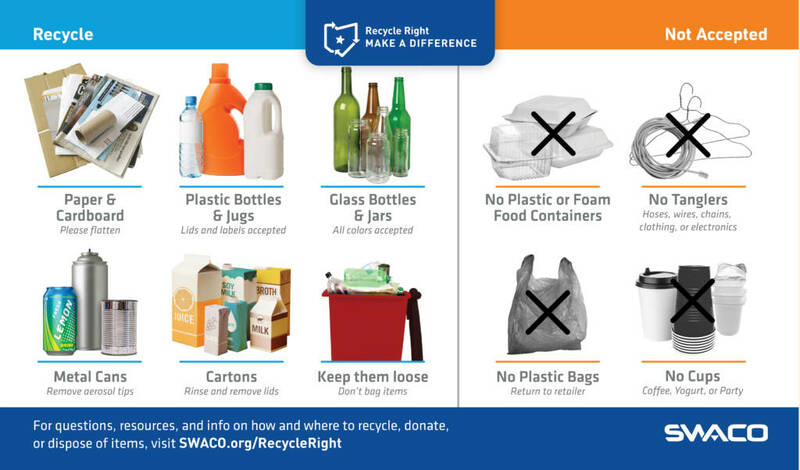 The Solid Waste Authority of Central Ohio in partnership with Jackson Township, City of Grove City and village of Urbancrest are the first to introduce “Recycle Right, Make a Difference” — a campaign to improve Franklin County’s recycling rate. More than 70 percent of material going into the Franklin County landfill may be recycled or composted despite the county’s current 46.5 percent recycling rate that exceeds the national average. Recycle Right is a program designed to promote proper recycling through recycling reminders and educational messages. One of the goals of Recycle Right is to reduce the amount of non-recyclable items put in recycle carts. Items like yogurt cups, plastic bags and wire hangers are put into bins causing recycling delays and additional expenses. Five kinds of materials are accepted for recycling in Franklin County. Everything else should be reused, donated, composted or disposed of safely. Go to swaco.org/RecycleRight to learn more about Recycle Right or the many benefits of recycling.